Since the release of their debut album, Pawn Shop, Brothers Osborne have been on a wild ride, one that’s included a number one single, Grammy nominations, numerous CMA and ACM Awards, a slot in the Nissan Stadium for CMA Fest and an upcoming sold out UK tour. It’s fair to say the Brothers from Maryland have done well for themselves! Following up such success was always going to be a tough ask, that dreaded second album, so they took themselves away to a beach house in Florida to figure it out. With producer Dave Cobb in tow, they came away with ten songs and named it after the resort, Port Saint Joe. The album kicks off with the sounds of the sea before John’s twangy and jangly acoustic guitar kicks in on Slow Your Roll. TJ’s baritone vocal kicks in and there’s no question that we’re listening to a Brothers Osborne album! The song has hints of the rootsy Dirt Rich that kicked off the last album but includes some seriously bluesy guitar from John. It’s a song about slowing life down and enjoying life with a nod to getting high. “It’s a down shift, de-stress, take myself a deep breath, watch it go up in smoke”. Track two is the first single off the album and is immediately recognisable from the guitar riff. Shoot Me Straight is Brothers Osborne at their rocking best. It’s ballsy, it’s badass and it’s brilliant. TJ sings about wanting a woman to just get it over with and shoot him straight so that he can move on. The song is a little bit similar to Stay A Little Longer but heavier and with a lot more attitude. John gets his chance to show off his chops with an extended guitar solo at the end, the guy is an absolute genius on the six string and shows it off well here. For all of those synth-pop country songs thank God we have John Osborne to melt our faces! Things slow down and take a turn to the more reflective on I Don’t Remember Me (Before You). It’s a song about not being able to remember the person that you were before you met someone special. TJ’s passionate vocals take centre stage on this song, giving it a tenderness and real emotion. He sings the chorus with real feeling and heart, “I heard I was a wild one, acting like a child some, but I really don’t recall”. There’s space for a John solo in here too. It’s a relatable song for those of us who were changed by someone special coming into our lives. Weed, Whiskey and Willie is another country ballad. It starts off with a bluesy intro from John on guitar before TJ comes in with his sorrowful vocals about how the only things that he can rely on in life are his weed, his whiskey and his country music. It’s another song where TJ shows the emotion and heart that he can squeeze into his vocals, they’re oozing with the type of sadness that makes classic country great. Everything about this song from vocals to music takes you to the desperate place that the narrator is in, surrounded by his vices and heartbroken. Things take a turn to a bluegrass sound on Tequila Again, a song which opens with the mandolin and has a strong 6/8 rhythm. It’ll keep your foot tapping throughout and singing along to the chorus. The Brothers are big fans of bluegrass music and will often incorporate it into their shows so it’s nice to see them commit this style to record. It’s a great drinking song where John shows off that his impressive chops are not just limited to the guitar with a great mandolin solo. It also goes to show that, by half way through the record, the Brothers can hit various genres and make it work. The funky, Motown intro to A Couple Wrongs Makin’ It Alright, offers another change of pace. With jangling guitars and wah pedals, the song is a complete to contrast to its predecessor and helps to lighten things up slightly. It works a little bit like Greener Pastures on the previous record in giving a little bit of fun and humour to the album. The jam at the end has a distinctly 60s feel to it, a little like the end of a Steppenwolf song. Track seven is Pushing Up Daisy’s (Love Alive). This is another tender love song with a big, emotionally charged chorus. TJ sings “we’ll go on ’til we’re pushing up daisy’s, grow old and wild and I’ll still be calling you baby”. The song has another brilliant guitar solo from John and keeps the slightly trippy vibe to it that the whole album has encapsulated. It’s a great song about finding a love that will last for the rest of your life and only dies when you do, “we ain’t getting out of this love alive”. Drank Like Hank kicks off with a big guitar riff and leads into some more rock ‘n’ roll. This is one of my favourite types of Brothers Osborne song and you just know that it’s going to be an absolute belter at their live shows. It’s that classic country music drinking song which gives nods to George Jones and Hank Williams, “we partied like The Possum and we drank like Hank”. The great thing about Brothers Osborne is that their music is so rich, you’ve got TJ’s vocals anchoring the whole thing down with John creating amazing textures on guitar throughout. This is a real stand-out for me on the album, great tune! Turn it up and get the windows down for this! The penultimate song on the album is A Little Bit Trouble. This kicks off with a really cool 60s soul vibe and is a brilliant chilled-out follow up to Drank Like Hank. It’s a love song about finding a woman who is a little bit trouble but its fine. It’s a great chill out song and has a brilliant throwback vibe whist feeling just as relevant as ever with Brothers Osborne. In the outro, John’s guitar just dances away over a chilled out rhythm as he channels a John Mayer-esque sound. It only feels like two minutes since we started the album but we’ve reached the final track, While You Still Can. This is a superb finish to the record, with a misty eyed look at the finite nature of life and how we have to make the most of it whilst we’re still here. For a couple of guys from Deale, Maryland who made took themselves from blue-collar living to country music superstars, this is an important lesson. TJ sings “everything you thought would last forever, never lasts forever like you planned”. In a day and age where we can become obsessed with material things and staring at phone screens all day, it’s a gentle reminder to make the most of the things and people that we have. Superb ending to the record. Many artists find it difficult releasing their second album after a successful debut, not Brothers Osborne. It speaks volumes as to the humble nature of these guys that they just went away and quietly knocked out a record which does exactly what they want it to do. They haven’t changed their sound to meet the needs of country radio, nor have they shoehorned in some singles to please a label, they’ve made an album of music that they love, hoping that their fans would too. From the laidback, stoner vibes of Slow Your Roll to the rocking tracks like Shoot Me Straight and Drank Like Hank or the bluegrass vibes of Tequila Again, the Brothers have thrown all of their influences into this record and come out with another amazingly well-rounded collection of songs. 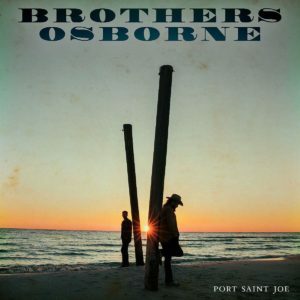 Once more, two of the most humble men in country music have proved that honesty and sheer talent can make the best music and boy does Port Saint Joe prove that! You can buy Port Saint Joe here!